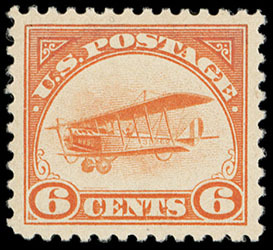 Airmail, 1918, 6¢ orange, o.g., never hinged, precision centering within large beautifully balanced margins, intensely radiant color, Superb, a stunning gem, with only 3 grading higher; with 2011 P.S.E. certificate Graded (Superb 98, SMQ $2,000). 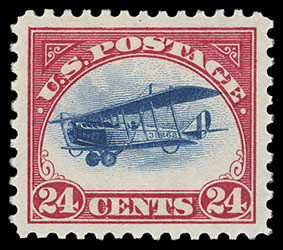 Airmail, 1918, 24¢ carmine rose & blue, o.g., never hinged, precise centering amid large evenly balanced margins, rich radiant colors on bright fresh paper, Superb, a truly magnificent gem; with 2015 P.F. certificate Graded (XF-S 95 XQ, SSV $425 for 95). 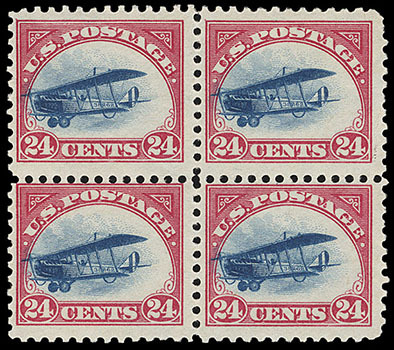 Airmail, 1918, 24¢ carmine rose & blue, Fast Plane Variety, block of 4, slightly disturbed o.g., gum crease affecting two stamps, otherwise F.-V.F., scarce in multiple format. Scott No. C3 var. Estimate $200 - 300. Airmail, 1923, 8¢ dark green, o.g., never hinged, perfect centering within large evenly balanced margins, rich bold color and remarkable freshness, Superb, a stunning never hinged gem; with 2017 P.S.E. certificate Graded (Superb 98, SMQ $450). 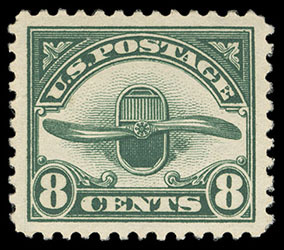 Airmail, 1923, 8¢ dark green, left margin single, o.g., never hinged, precision centering amid large evenly balanced margins, bright bold color and sharp proof-like impression, Superb, a extraordinary never hinged gem; with 2007 P.S.E. certificate Graded (Superb 98, SMQ $450). 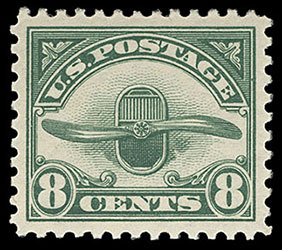 Airmail, 1923, 8¢ dark green, o.g., never hinged, perfectly centered, rich vivid color, Superb, a striking gem; with 2012 P.S.E. certificate Graded (Superb 98, SMQ $450). 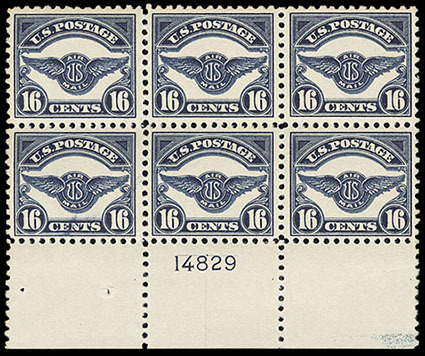 Airmail, 1923, 16¢ dark blue, bottom margin plate no. "14829" block of 6, o.g., never hinged, deep color, bright and fresh, Very Fine. 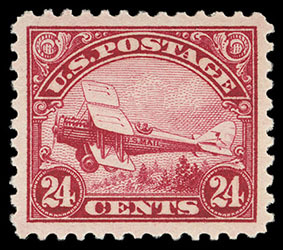 Airmail, 1923, 24¢ carmine, o.g., never hinged, perfectly centered within evenly balanced margins, rich and intensely deep color, Post Office freshness, Superb, a remarkably choice airmail issue, with only eleven graded higher; with 2010 & 2013 P.S.E. certificates, both Graded (Superb 98, SMQ $1,200). 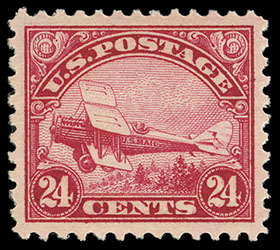 Airmail, 1923, 24¢ carmine, o.g., never hinged, large beautifully balanced margins and exceptional centering, rich bold color, Superb; with 2013 P.S.E. certificate Graded (Superb 98, SMQ $1,200). 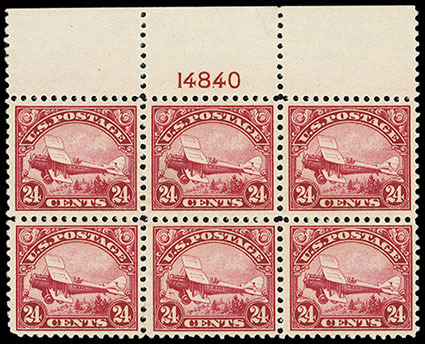 Airmail, 1923, 24¢ carmine, top margin plate #14840 block of 6, o.g., never hinged, brilliant color and detailed impression, unusually nice centering, Very Fine and choice, a premium quality and scarce top position plate block.